Fargo 44211 premium black resin (KO) ribbons are monochrome (1-color) ribbons, with an overlay (O) panel. 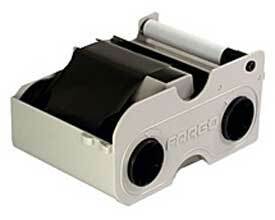 The ribbon is housed in an easy-to-use cartridge, which also includes a cleaning roller. Fargo 44211 premium black resin + overlay ribbons are primarily used for printing text and one-color line art on one or both sides of a PVC card. If you'll be printing barcodes, a premium resin ribbon like the 44211 is recommended, for bolder, easier-to-read barcodes. The O overlay panel provides a thin layer of protection to your cards.